FORT WORTH, Texas — A shake-up may be coming for the F-35 supply base, as Lockheed Martin considers opening up new competitions for the jet’s electronic warfare and communications systems. The goal? To drive down the life-cycle costs of key technologies — especially during operations and sustainment — by forcing defense firms to face off against each other. In an June 22 interview at Lockheed Martin Aeronautics headquarters in Fort Worth, Texas, Branyan stressed that the company had not made a firm decision on whether to recompete the electronic warfare system currently provided by BAE Systems or the Northrop Grumman-made communications, navigation and identification, or CNI, system. However, Lockheed is exploring its options, having sent out a request for information to a handful of defense contractors who specialize in such technologies. “We’re evaluating right now the RFI responses and determining if it’s a good time to go do a competition and what would that competition entail,” Branyan said. “Sometimes you look at what’s there and it’s not a sea change enough that’s worth the effort to go do the competition. It wouldn’t be enough for a change in cost and performance. In its quest to cut costs on the program, Lockheed has already recompeted several systems, including the aircraft’s memory system and the panoramic cockpit display. Most notably, the company confirmed in June that Raytheon would produce a new version of the distributed aperture system, or DAS, which would save $3 billion over the cost of the program. Buying the Raytheon system could help Lockheed Martin lower the lifecycle cost of the joint strike fighter. Lockheed plans to decide whether to recompete the EW and CNI systems by the end of 2018. The Pentagon’s F-35 Joint Program Office would also weigh in, as there could be up-front engineering and development costs that would have to be folded into the budget and the jet’s modernization strategy. Branyan declined to detail which companies Lockheed had solicited as part of the RFI process, but said that most companies tend to respond because the F-35 business case — which includes 2,456 F-35s for U.S. customers and hundreds more for the international market — guarantees steady, profitable work. The F-35 is considered to have a formidable electronic warfare capability due to its current EW suite, the AN/ASQ-239, although the Pentagon has revealed few details about how the system allows the F-35 to find and jam enemy radars. BAE Systems declined to comment on how it could improve the AN/ASQ-239, should a contest move forward. Integrating a new electronic warfare system would be the most ambitious of the F-35 recompetes so far. The risk it would pose to the program is not necessarily insignificant, but it could be worth it if it helps Lockheed pare down costs, said Richard Aboulafia, an aerospace analyst with the Teal Group. The Raytheon-built DAS — which fuses together imagery from the F-35’s six electro-optical infrared cameras to project a complete picture of the battlefield to the pilot’s helmet — could provide a model on how to quickly develop and integrate advanced tech like a new EW system. 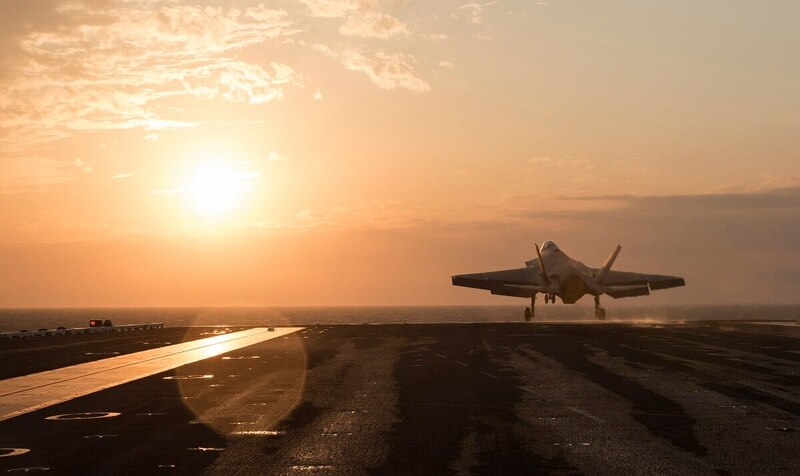 In order to equip the 15th lot of F-35s slated for delivery in 2023, Raytheon will have to sprint to be ready to build at full rate — 150 ship sets per month — by July 2022, Branyan said. A critical design review for the new DAS is scheduled for April 2019, and from there the company will move quickly through integration, ground tests and flight qualification. Branyan said he’s not worried that incorporating the Raytheon system could pose undue risk to the program. There’s no fallback option to continue production of Northrop’s DAS, the current model aboard the F-35, but the test plan includes about a year of buffer time in case the system needs additional work. “All the working parts of it were already flying on other platforms. So it’s a very mature technology. Essentially they’re just repackaging it into the F-35 and integrating it into our interfaces,” he said.